The Portola Art Gallery presents a joint show in June by two of its newer gallery artists – Jared Sines and Nancy Stevenson. The two artists welcome the public to a reception from 1:00 to 4:oo pm on Saturday, June 11. Jared Sines’ Expressive Realism features his impressionistic landscapes and still life scenes, along with several “vintage” works from his private collection. Jared especially enjoys painting water scenes – from views of the Pacific coastline to inland lakes and streams – and rural subjects, such as old barns and fields of wildflowers. Jared’s work can also be found at the New Masters Gallery in Carmel and the Garden Gallery in Half Moon Bay, where we displays more intricately detailed landscapes and still life scenes. 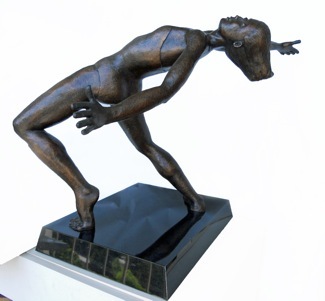 Nancy Stevenson’s Echoes from Life includes bronze sculptures that express universal emotional experience. Although her figures are presented realistically, she seeks to convey meaning largely through gesture and expression. Nancy’s emphasis on the communication of feeling may stem in part from her earlier career as a clinical psychologist, working with children and families. The pieces in this collection represent a range of subjects, from young children to older adults. Some have been built using models; others from her imagination and experience. The Portola Art Gallery is located at the historic Allied Arts Guild on Arbor Rd. in Menlo Park.